This April 7 CFNU will once again be recognizing World Health Day, and have created social media share graphics to mark the day, attached in both official languages and optimized for Twitter and Facebook. Please feel free to join CFNU in recognizing this event if desired. 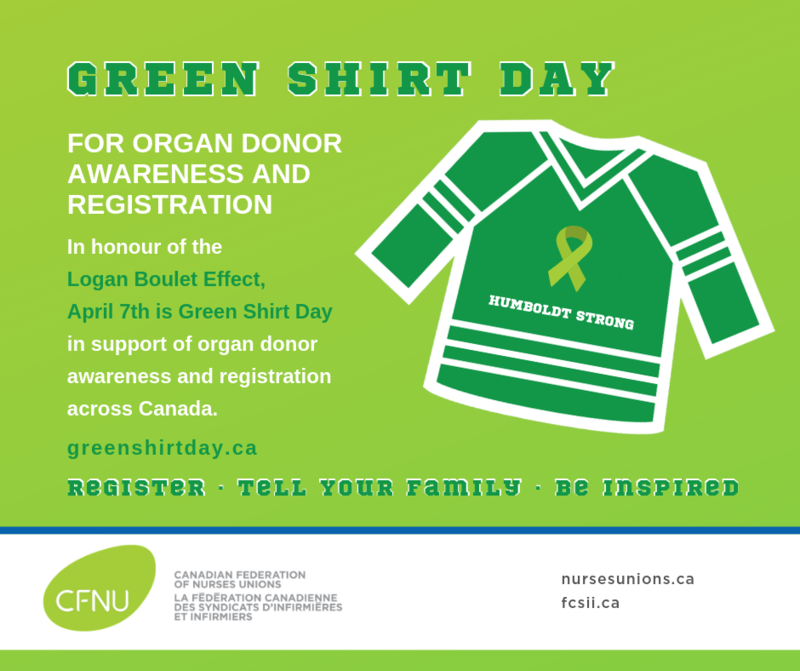 In addition, this April 7 is also Green Shirt Day, in honour of the Logan Boulet Effect, supporting organ donor awareness/registration across Canada. Logan was a Humboldt Broncos defenceman who lost his life in the devastating crash of April 7, 2018. Logan was an organ donor and the media coverage of his donation inspired more than 100,000 people to register as donors. We are proud to also mark Green Shirt Day and have created share graphics, attached.